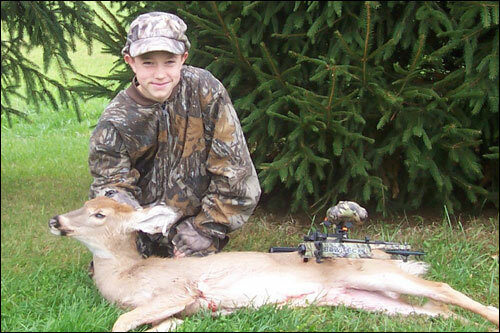 The wait was over for my son, Tyler, as the first day of the 2003 Ohio archery season dawned. Years of dreaming and preparation had finally materialized into reality. It was an experience I will never forget. It changed my hunting priorities and revitalized my passion for the sport. Watching Ty methodically go through the ritual I had introduced him to was thrilling. It was happening right before my eyes - the birth of a bowhunter. Hunting is predictably unpredictable, though and the road to success was anything but easy. We shared many memorable hours on stand and several nerve-racking close encounters with deer. Most of our hunting was done on Dave Conrad’s (Mohican on the Bowsite) property near Mt. Vernon. Dave is not only my hunting partner but a great friend also whose selflessness is mind-blowing. Trail camera pictures of a true giant non-typical, harvested a short distance away that scored at 233”, and a few other large bucks led us to concentrate our efforts in that area. 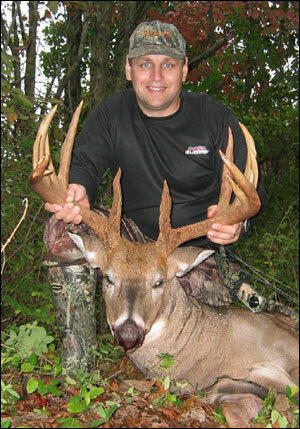 The first day we had a beautiful 8-point buck pass just out of range that would make any bowhunter’s heart leap! Later, one week before the full blown rut kicked in, we witnessed a 140” drop-tine bruiser chase a doe up and down the field for 20 minutes. We were having a great time. Finally, on a cool November morning a doe walked nervously into Ty’s shooting lane. If I weren’t afraid of hurting his feelings I would have burst out laughing right on the spot as he shook in a manner that reminded me of an engine piston and his shot flew 3 feet high! He was a little upset but mostly just embarrassed and just couldn’t understand what happened. After discussing the fine points of buck fever and a few tricks to control it he was ready for another opportunity. That moment would come just 7 days later, or so I thought, near my home in Wilmington. I sat in a make-shift ground blind while he perched in a tree just 15 yards away on the edge of a field. Fifteen minutes before last light several doe emerged from the tree line 20 yards from Ty’s position. The lead doe angled directly toward him and came within 15 yards milling around as she delicately picked up single pieces of corn left over from the farmer’s crop. Ty drew his bow. After a short time she turned and walked straight away. The hunt was over. As we gathered our gear I asked him why on earth he didn’t shoot. His answer was simple, “she didn’t stop moving long enough while in a good shooting position for me to make a shot I was comfortable with”. I was one proud papa! That was a level of maturity and discipline that I didn’t find until many years into my hunting adventures. He explained that he had used the buck fever tricks we had talked about and that he remained calm the whole time the bow was drawn. I sensed, and was impressed with, his confidence and command of the situation. It was yet unproven but it seemed genuine to me. Soon, gun season was upon us and wanting so badly for Ty to taste success I borrowed a shotgun from close friend, Greg Keeton (Tree stump on the Bowsite), and had him practice with it. When the day drew near for us to venture out with the gun Tyler shared something with me that floored me – He didn’t want his first deer to fall to a gun. It was either bow or nothing at all. I was really a proud papa! The year ended and Ty’s tags went unfilled but he was ok with that. He has seen some amazing sights and learned some valuable lessons. I also had learned a lesson; do not underestimate the ability or character of a young person based on your own past actions or what the “norm” may be. My son had shown himself to be of great resolve and maturity beyond his years during the season. I am proud to be his father. 2005 found us spending most of our time on another of Dave Conrad’s properties in Loudonville, actually the family farm where he grew up. Ty was shooting a new Bowtech Justice (what a sweet bow! ), which he had practiced with for hundreds of shots - He was ready! Granny’s (Granny is what everyone calls Dave’s mom) farm had great potential with high deer numbers and some great bucks. Tyler actually had a P&Y class buck right underneath his treestand with his bow drawn. He never took the shot because while he could see the deer in his peep sight he couldn’t pick a particular spot on the deer to aim at due to fading light conditions. Great restraint. When we went back to the truck I noticed a “missed call” on my cell phone. I checked the number and told Ty to get in the truck – we were leaving. The number was Dave’s cell phone and I knew he wouldn’t be calling that early unless his wife had the baby or he scored on the big one we had been watching. Either way, we were on our way. Dave had worked so hard for this giant buck scouting hard, planning and getting trail camera pictures because he knew, with a baby soon to be born, that he had to make it happen fast if it were going to happen at all. Half way to Dave’s other property we got the call, Dave had zipped an arrow through the bruiser with his Bowtech Patriot Dually just 15 minutes into the season and was asking if we could help track it. He laughed when I told him we were already half way there and closing in quickly! Once we arrived Dave told us the story and guessed where he thought the buck most likely went. After talking it over and deciding that the time was right, we set out. Dave was seriously nervous but the blood trail told the story; we were going to find this deer. Ty was the first to see the monster and after Dave confirmed with his binoculars we all let out a shout and ran to the deer. Dave’s first words were, “it broke an antler off!” My heart sunk but as I grabbed the side of the rack that still remained the earth moved on the other side – he had driven the left side of his rack completely under the ground all the way up to his head! What an experience! After all the excitement Tyler and I headed back to Loudonville for our evening hunt. We didn’t have any luck that evening or for the next two Saturdays. Hmmmmm, this was going to be harder than I thought! Finally though, it happened…. Click here to congratulate Tyler on his first bow kill! I cannot tell you how exciting that whole experience was for me as a father! Before I had children, people would say that being a part of your child’s first harvest was an incredible experience. Not without sacrifice but awesome all the same. I never gave it much thought but can now confirm those statements. Taking my 140” 10 point last year did not even come close in comparison. I have six children and at least four of them have expressed an interest in hunting so by the grace of God I hope to experience the above scenario over and over! Bowsite Note: for 2005 we will be spotlighting as many kids' features as we can get. If you're youngster has a good hunting story we'd like to include it as a feature. 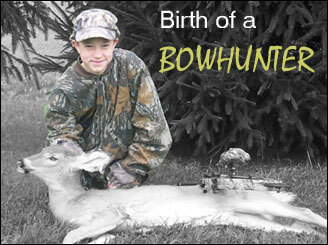 Send them on along with any digital pics to info@bowsitemail.com!